Executed in 1970, this work is from the Peace Portfolio I.
Lithograph printed in brownish ochre, a fine, fresh impression of the only known state, the full sheet, printed on white Arches wove paper, nearly to the edges in most places, hand-signed and numbered in pencil by the artist, pulled in an edition of 175 examples (there were also a handful of artists proofs, some of which exhibit slight variations from the edition,) printed and published by Mourlot Graphics, in fine condition, unframed. Canberra, The Australian National Gallery, The Spontaneous Gesture: Prints and Books of the Abstract Expressionist Era, 06 June - 13 September 1987, p.81, figure 75, illustrated; also illustrted on the front and back covers in colour. 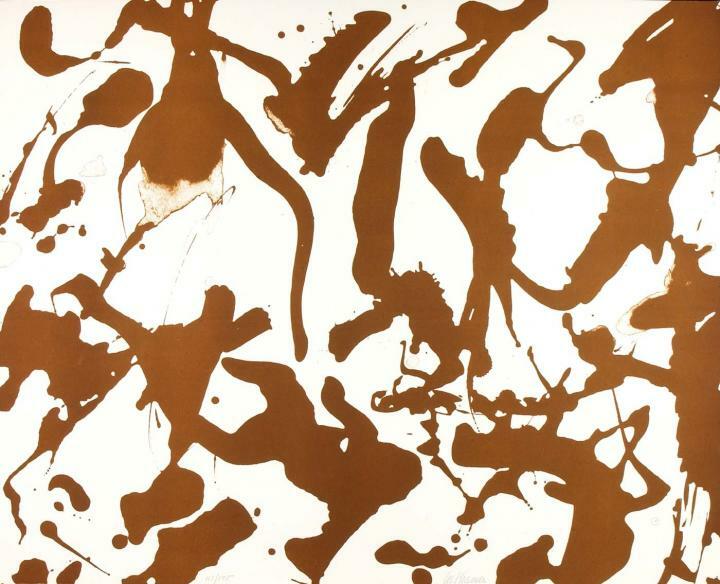 Landau, Ellen G.. Lee Krasner: A Catalogue Raisonné. 1995, New York, Harry N. Abrams, pp.262, no. CR536, illustrated in color (another example). Untitled (The Megaphones) can be found in the following selected collections: The Brooklyn Museum, Brooklyn, NY; The New School for Social Research, New York; The Fogg Art Museum, Cambridge, MA; The Grand Rapids Art Museum, Grand Rapids, Michigan; Rose Art Museum, Brandeis University, Waltham, MA; The Australian National Gallery, Canberra and The Pollock Krasner Foundation, East Hampton, NY. "Twelve artists contributed to a project sponsered by the Academic and Professional Action Committee for a Responsive Congress, NY, to help raise money to contribute to forty canditated designated by the Universites National Antiwar Fund. These men and women, running in the 1970 elections, were committed to ending the war in Southeast Asia. This was considered by the sponsers a prerequisite 'so that the nation can return to the pursuit of social and racial justice at home.' Others participating included Stanley William Hayter, Saul Steinberg, Herbert Ferber, Ibram Lassaw, Robert Motherwell, Robert Rauschenberg and Larry Zox; Krasner was the only woman to donate her work."